This is the question posed by co-author Richard Moniz in the introduction to The Mindful Librarian: Connecting the Practice of Mindfulness to Librarianship. It’s also the essence of why the five authors of this fascinating guide chose to interweave the recent findings on mindfulness into the daily life of library work. By understanding how to be more mindful ourselves, we can become both better librarians and better – happier, more present, more engaged – human beings. Making the case that “librarianship as a profession has a natural fit with mindfulness,” the book starts off with a helpful introduction to mindfulness (a practice thousands of years old). Co-authors Moniz and Slutzky then explore what cognitive science is now discovering through magnetic resonance brain imaging about mindfulness-based stress reduction (MBSR), first pioneered by Jon Kabat-Zinn and described in his landmark book, Full Catastrophe Living (rev. ed., Bantam, 2013). 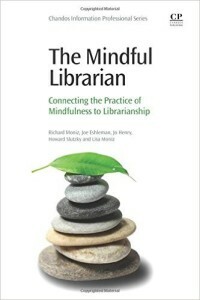 The next seven chapters describe the application of mindful librarianship practices in various environments and activities, e.g., the undergraduate research process, in alignment with ACRL’s Framework for Information Literacy, when providing reference service, when establishing and growing positive relationships with faculty, when working in a leadership position, and when working to avoid the burnout that can beset solo librarians. A chapter on the mindfulness movement in education draws the through-line between mindfulness in K-12 up and into higher education. For MLIS/iSchool students, see especially the text in Chapter 3 on creating a “more mindful research paper” – very helpful for lowering your stress/anxiety level! For those new to mindfulness as a topic, you’ll find a librarian’s mindset in operation here: definitions of key concepts, recommended resources, practice activities, and a thorough review of key authors and their works are found in most chapters. And for those interested in meditation (which can be a great basis on which to begin a mindfulness practice), co-authors Dr. Richard Moniz and Dr. Howard Slutzky, Associate Professor in Psychology at Johnson & Wales University in Charlotte, NC, provide a user-friendly overview of ways to begin learning to meditate or incorporate meditative practices such as walking meditation or t’ai chi into your life. Designed to be used as either a textbook or a personal guide, The Mindful Librarian covers all the scholarly research bases but is written in an accessible, supportive tone by authors who have personally experienced the stresses they describe. Three of the five co-authors are academic librarians and another has worked in both school and public libraries. They feel your pain, literally – as co-author Moniz writes in his introduction, “I have struggled with anxiety and issues related to a lack of mindfulness all my life.” It’s this kind of reality-based approach that makes the book more than a scholarly resource; instead, it’s a trusted guide and a practical handbook. In a previous career phase, I was the Chief Content Officer for an online start-up focused on mental health, cognitive science, and the psychology of well-being. In that role, I got to explore what constitutes a “good life” for most of us, and came to understand how key mindfulness is to happiness (and effectiveness) in all aspects of our lives. At the time, people were starting to realize how this seemingly simple concept and process could reduce stress in our professional lives as effectively as it does in our personal lives. Needless to say, regardless of what type of librarianship you practice, a high level of stress in our field is now constant enough to make many of us doubt our career choices. If you’re in that frame of mind, I’d highly encourage you to read The Mindful Librarian and see if you can’t reconnect to – and keep – the passion that first inspired you. The Mindful Librarian: Connecting the Practice of Mindfulness to Librarianship. By Richard Moniz, Joe Eshleman, Jo Henry, Howard Slutzky and Lisa Moniz. Chandos Publishing, 2016. 215p. ISBN978-0-08-100556-2.